‘Arrow’ Season 2: Will DC’s Solomon Grundy Come to Life This Year? 'Arrow' fans well know that the second season has begun dabbling in more super-powered DC lore, introducing Grant Gustin's Barry Allen on December 4, as well as multiple interweaving plots teasing the emergence of super-strength, and the supernatural altogether. With that in mind, has the latest press release confirmed the appearance of undead DC-heavy Solomon Grundy? Spoiler warnings from here on out, but those who caught this past week's 'Arrow' installment "State V. Queen" might not have bat an eye at one of the hour's final scenes, which featured Brother Blood (Kevin Alejandro) addressing one of his henchman to survive a super-strength formula as "Cyrus." An ambiguous enough name to be certain, but the latest press release of episode 9, mid-season finale "Three Ghosts" confirms the character as Cyrus Gold, who has the pre-death name of DC's Solomon Grundy! OLIVER IS VISITED BY GHOSTS FROM THE PAST — After a fight with Cyrus Gold AKA the Acolyte (guest star Graham Shiels), Oliver (Stephen Amell) is drugged and left for dead. Determined to cure him, Felicity (Emily Bett Rickards) makes a risky decision. The cure causes Oliver to hallucinate, and what he sees forces him to confront his past. Meanwhile, Barry (guest star Grant Gustin) continues to help Felicity, and their connection grows stronger. The Arrow asks Lance (Paul Blackthorne) to look into Gold, but when the stakeout on Gold goes bad, someone is killed. Roy (Colton Haynes) is captured and tortured by Brother Blood (guest star Kevin Alejandro). Of course, we've no guarantee that "The Acolyte" could end up "reanimated" by any means as the infamous Solomon Grundy, but the mere incorporation of the name, compounded with all the biochemical superpower talk makes for an exciting zombie prospect down the line. And hey, who's to say he might not end up haunting the purported 'Flash' spinoff? Well, what say you? 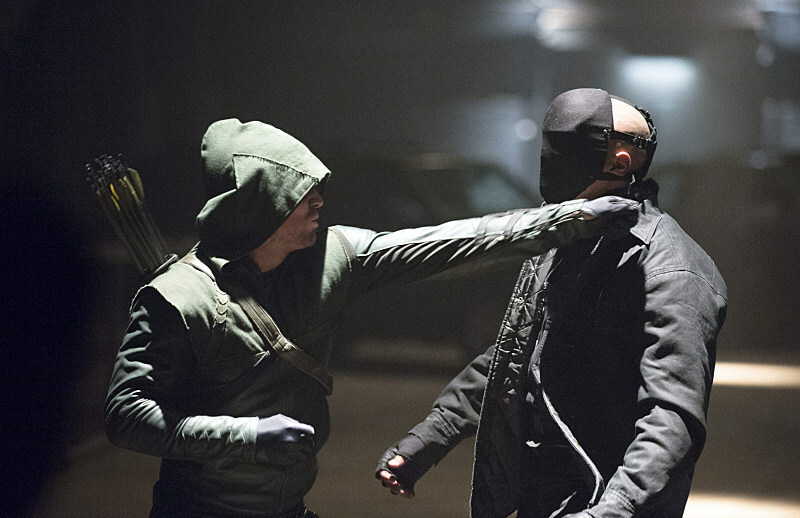 Is 'Arrow' gearing up for more comic-friendly villains in the future, or tossing in a few mere Easter eggs? Check out a photo of Oliver fighting "The Acolyte" below, and tell us what you think about the Solomon Grundy reference in the comments! Source: ‘Arrow’ Season 2: Will DC’s Solomon Grundy Come to Life This Year?